Coronary cameral fistula is a rare entity and is characterized by an abnormal communication between coronary artery and a cardiac chamber. It is usually congenital and asymptomatic in majority of patients. If symptomatic the patients usually present in childhood. We present a case of 45-year-old male who presented with anginal chest pain and dyspnea on exertion for last 1 year. His exercise treadmill test was positive for ischemic changes and ECG-gated contrast enhanced CT was done for further evaluation. 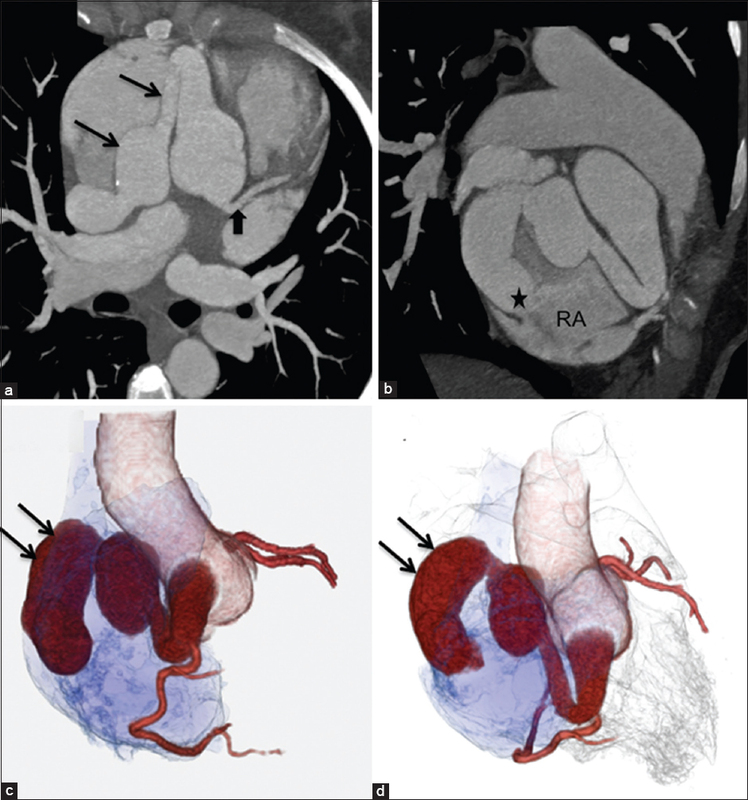 CT showed a large right coronary artery to right atrium fistula. It also ruled out any coronary atherosclerosis as reason for chest pain and ischemic symptoms on exercise treadmill test. The fistula was successfully closed by surgery and there was resolution of chest pain and dyspnea. Coronary cameral fistulas (CCFs) are rare and are characterized by abnormal communication between coronary artery (CA) and cardiac chamber that usually results from aberrancy of normal embryological development. Majority of the CCFs are asymptomatic, and it is exceptionally rare to have a single fistulous communication presenting with chest pain in middle age. We here present a rare case of symptomatic CCF diagnosed by electrocardiogram (ECG)-gated multidetector computed tomography (MDCT) with resolution of the symptoms following successful repair. A 45-year-old non-smoker, male, with no significant past medical history, presented to the outpatient clinic of our hospital with progressive dyspnea on exertion and anginal chest pain for one year. He reported having an echocardiogram in an outside hospital that showed a tortuous vascular channel along the right atrium concerning for CA aneurysm. The cardiac and respiratory exam was unremarkable. The cardiac apex was not displaced, and there was no murmur. ECG showed normal sinus rhythm with no ST/T wave changes. His exercise treadmill test was positive for ischemic changes with accompanying chest pain. Electrocardiogram-gated contrast-enhanced (CE) MDCT was done for further evaluation of the anomaly. Prior to image acquisition, the patient received oral metoprolol for heart rate control and also received 0.8 mg of nitroglycerin immediately before scanning for coronary vasodilatation. CECT showed an enlarged and tortuous right CA [arrows in [Figure 1]a-d] in the right atrio-ventricular groove that drained into the right atrium [star in [Figure 1]b] consistent with a CCF. CT also showed the absence of any coronary atherosclerosis. Three-dimensional volume rendered (VR) images accurately depicts the relationship of the enlarged right CA to the aorta, right-sided chambers, and the CAs. Since the patient was symptomatic, surgical closure of the fistula was done. The postsurgical course was uneventful with resolution of chest pain and dyspnea. These fistulae are asymptomatic in the majority of cases and are detected incidentally. Symptomatic CCF is rare, symptoms are more common in patients with multiple CCF. Although uncommon, even single CCF may be symptomatic. The presence or absence of symptoms may be related to the size of the fistula and the site of origin and termination of the fistula. These fistulae may cause angina by coronary steal phenomenon and diastolic overload. Classically, diagnostic coronary angiogram has been used for diagnosis and has been considered as a gold standard for diagnosis  but with advances in noninvasive cardiac imaging, these fistulae are being increasingly diagnosed by MDCT or echocardiogram. To conclude, CCFs are rare and symptomatic CCFs are even rarer. We hereby present utility of ECG-gated MDCT for demonstration of origin, draining chamber and size of CCF. Given high negative predictive value (nearly 100%) of coronary CT in ruling out coronary atherosclerosis,  it also helps in ruling out coronary atherosclerosis as the cause of patient's symptoms. Hence, we propose that MDCT can be done as sole preoperative imaging in low-risk CA disease (CAD) patients with CCF. ECG-gated MDCT circumvents the need of invasive diagnostic coronary catheterization in low-risk CAD subset patients not only for diagnosing/preoperative planning, but also by ruling out CAD. Vavuranakis M, Bush CA, Boudoulas H. Coronary artery fistulas in adults: Incidence, angiographic characteristics, natural history. Cathet Cardiovasc Diagn 1995;35:116-20. Padfield GJ. A case of coronary cameral fistula. Eur J Echocardiogr 2009;10:718-20. Brooks CH, Bates PD. Coronary artery-left ventricular fistula with angina pectoris. Am Heart J 1983;106:404-6. Qureshi SA. Coronary arterial fistulas. Orphanet J Rare Dis 2006;1:51. Saboo SS, Juan YH, Khandelwal A, George E, Steigner ML, Landzberg M, et al. MDCT of congenital coronary artery fistulas. AJR Am J Roentgenol 2014;203:W244-52. Saboo SS, Steigner M, Ghosh N, Ho C, Groarke JD. Multimodality non-invasive imaging of a coronary cameral fistula. Eur Heart J Cardiovasc Imaging 2014;15:231. Chia BL, Chan AL, Tan LK, Ng RA, Chiang SP. Coronary artery-left ventricular fistula. Cardiology 1981;68:167-79. Janne d′Othée B, Siebert U, Cury R, Jadvar H, Dunn EJ, Hoffmann U. A systematic review on diagnostic accuracy of CT-based detection of significant coronary artery disease. Eur J Radiol 2008;65:449-61.